Dual diaphragm booster. Pushrod is 3/8" fine thread. Compact, 7" diameter for installation under floor or on firewall of almost any vehicle. Has a zinc chromate finish. 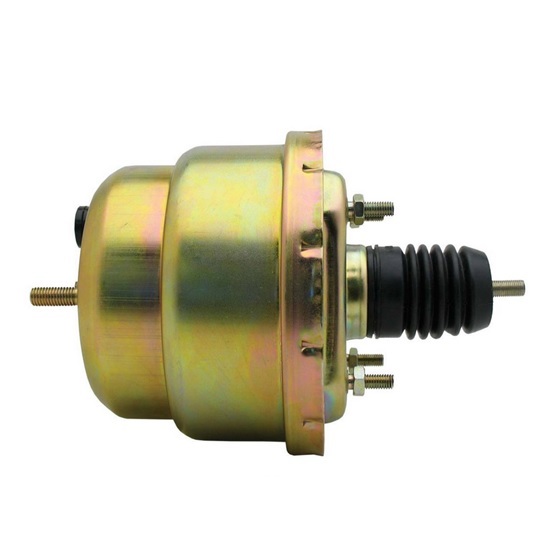 Learn more about selecting the proper brake booster for your vehicle by reading our tech article. Brake System Selection. Pushrod is 4" long from firewall mount face to end of pushrod. Length from mount face to M.C. mount face is 5-1/4". Pushrod extends 4" from mount face and has 3/8"-24 threads. Mount bolts are 5/16"-20 x 7/8". Installation Note: Before installing the master cylinder onto the booster, you may need to make an adjustment. The pushrod on the brake booster should protrude 1/16" from the face of the booster to insure proper engagement with the master cylinder.